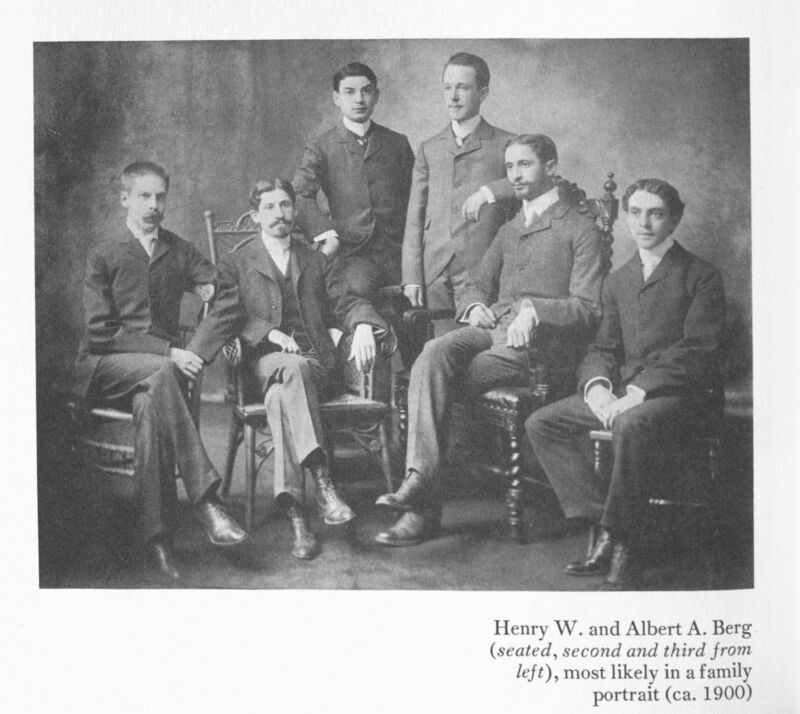 New York physicians Henry W. and Albert A. Berg are well-known to students of literature. In 1940, Albert A. Berg founded the New York Public Library’s spectacular Berg Collection, endowed in his older brother Henry’s memory. It is a magical place, nestled on the third floor of NYPL’s Steven A. Schwarzman building, with endlessly deep collections in its vaults (I should know, I was lucky enough to work there). Highlights include a typescript draft of T.S. Eliot’s The Wasteland, annotated by Ezra Pound; the manuscript notebooks containing five of Virginia Woolf’s seven novels; and a map drawn by Jack Kerouac of territory covered on the cross-country trip that inspired On The Road. Left: Dr. Albert A. Berg, holding Blake’s Europe, in an oil portrait by Jean Spencer hanging in The New York Public Library’s Berg Collection. 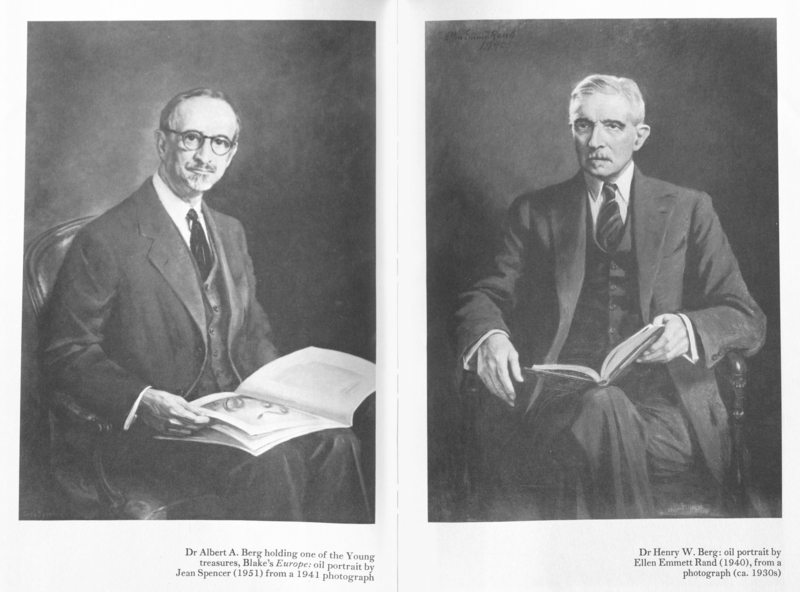 Right: Dr. Henry W. Berg in an oil portrait by Ellen Emmett Rand, also in the New York Public Library’s Berg Collection. In Szladits, Brothers: The Origins of the Henry W. and Albert A. Berg Collection,1985. Click to enlarge. Fourteen years separated the eldest and youngest Berg siblings, but they had much in common, including interests in book collecting and literature, along with an aptitude for real estate investment (a pastime that funded their library interests). The two doctors lived together until Henry’s death in 1939 in a townhouse on East 73rd Street. The story of Henry and Albert Berg’s establishment of one of the world’s great literary collections is told in Lola Szladits’ excellent book, The Brothers. Henry W. and Albert A. Berg (seated, second and third from left), most likely in a family portrait (circa 1900). In Szladits, Brothers: The Origins of the Henry W. and Albert A. Berg Collection,1985. 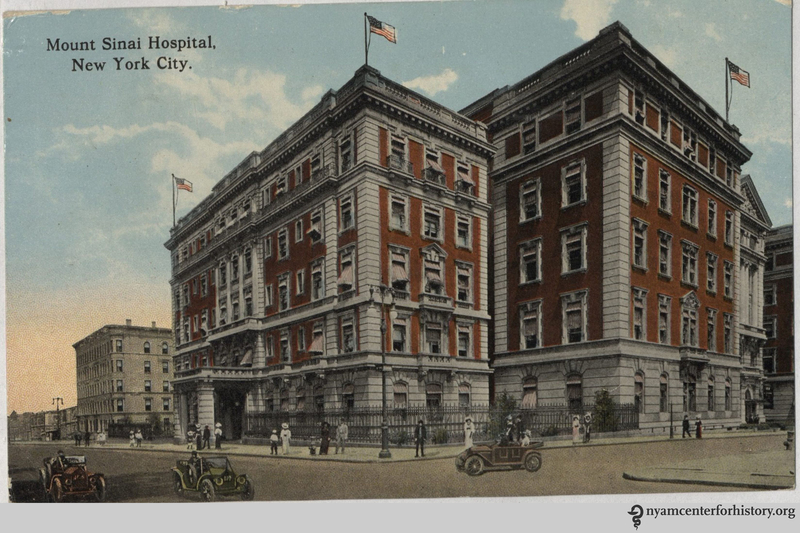 Henry earned his medical degree from Columbia University’s College of Physicians and Surgeons in 1878, specialized in infectious disease, and headed Mount Sinai’s isolation service. He taught both neurology and pediatrics at the College of Physicians and Surgeons.2 Henry was attending physician at Willard Parker Hospital on East 16th Street for 40 years, until his death in 1939.3 His active role on Willard Parker’s board is documented in the Academy’s collection of Willard Parker minute books. It was Henry who mentored Albert, put him through medical school, and showed him he could be a great doctor. All early indications were to the contrary: Albert repeatedly ditched class to play pool. Their mother was skeptical that Henry could ever make a doctor out of him.4 But by graduation (also from College of Physicians and Surgeons), Albert was a decorated prizewinner.5 And as a surgeon, he proved a brilliant and visionary pioneer, a key player in the development of abdominal surgery in the United States. 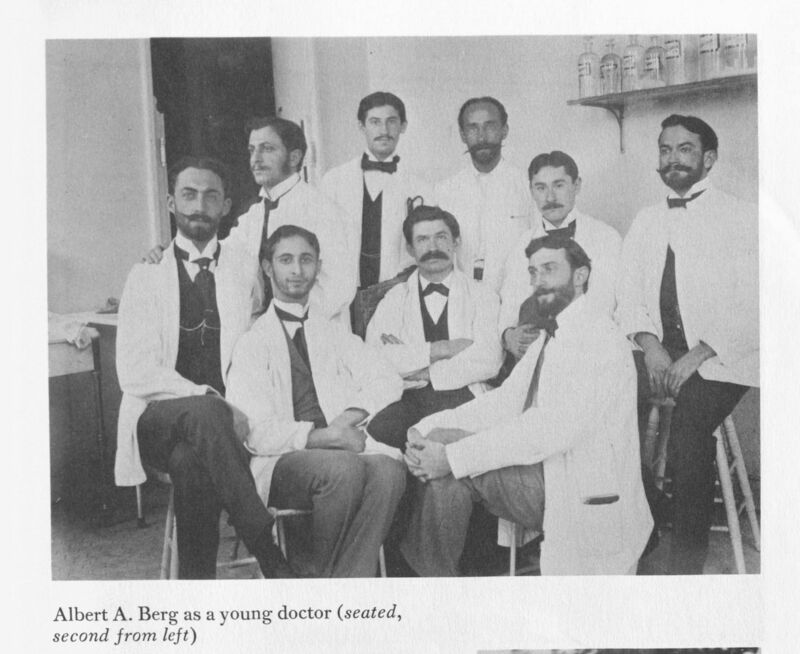 Albert A. Berg as a young doctor (seated, second from left). In Szladits, Brothers: The Origins of the Henry W. and Albert A. Berg Collection,1985, page 37. 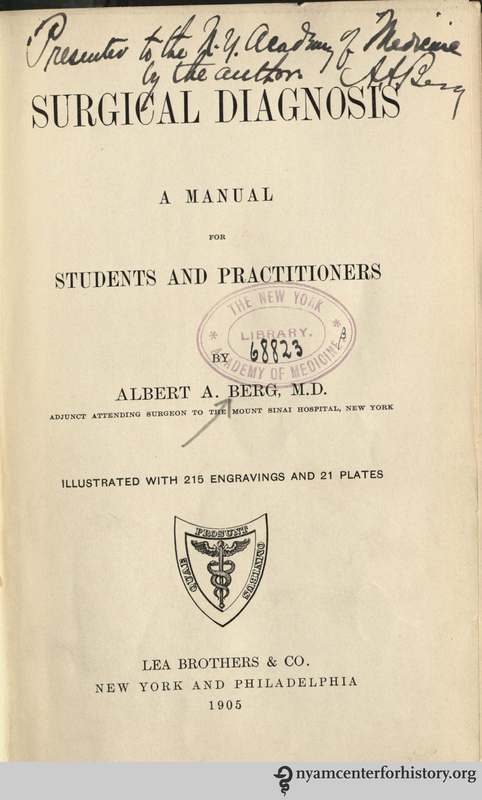 Title page of Alfred A. Berg’s Surgical Diagnosis, 1905, given by the author to the New York Academy of Medicine Library. Mount Sinai Hospital, circa 1913. From The Dr. Robert Matz Collection of Medical Postcards. A stone’s throw away from A.A. Berg’s beloved Guggenheim pavilion at Mount Sinai Hospital, the Berg name lives on. On the third floor of the New York Academy of Medicine in the former periodicals room is a bronze plaque commemorating the gifts of Drs. Henry W. and Albert A. Berg to the Academy. A bequest from Albert endowed the third floor room that bears their name and still supports the acquisition of library periodicals today. Both brothers were Academy Fellows (Henry beginning in 1890, Albert in 1900). Albert seems to have recognized how vital a good set of tools were to students of surgery. A copy of his last will and testament in the Academy’s archives entrusts his surgical instruments, instrument bags, and laboratory equipment, including two microscopes and examination tables and one portable operating table, to “one or more deserving young surgeons” to be selected at the Academy’s discretion.11 The items are no longer at the Academy; perhaps they were also used by a student whose path to medicine was at first uncertain, but later found his or her way. New York Times article from July 18, 1950 announcing Albert A. Berg’s bequests, including to the New York Public Library and the New York Academy of Medicine. Click to enlarge. 1. Szladits, Lola. Brothers : The Origins of the Henry W. and Albert A. Berg Collection. New York: New York Public Library, 1985. pp. 9-10. 3. Medical Society of the State of New York. Medical Directory of New York, New Jersey and Connecticut. New York: 1899-1939. 4. Louchheim, Katie. “Sweeping Formalities and Offstage Flourishes.” The New Yorker 3 Nov. 1975: 40-48. Print. 6. Ginzburg, Leon. “Some of the Principles and Methods contributed by the service of Dr. A.A. Berg.” Journal of the Mount Sinai Hospital Volume 17.6 (1951): 356-368. The Journal of the Mount Sinai Hospital has been digitized and is available online. 9. New Yorker and Szladits. 11. The New York Academy of Medicine Archives. Library Correspondence, 1927-1974. This entry was posted in Collections, History of medicine and tagged 19th-century medicine, 20th-century medicine, Albert A. Berg, book collecting, Henry W. Berg, history of surgery, New York Academy of Medicine Library, New York Public Library by nyamhistorymed. Bookmark the permalink.